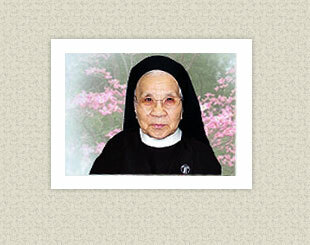 Celebrating 60 years since her First Profession of Vows, we recognize Sister Peter Damian Chiang in June. Born on June 29, 1923, in Hwimin Chiang, China, Susanna Chiang had no idea that one day she would consider Springfield, Illinois her home. At the age of 24, a shy Susanna ended her teaching job at a grade school in Chowston, China. She was drawn to the lifestyle of the Hospital Sisters of St. Francis, whom she would see every Sunday at Mass at her parish. On October 4, 1947, she entered the convent at St. John’s Dispensary, Chowston, which also served as the Novitiate for the Chinese Sisters who sponsored St. Joseph’s Hospital in Jinan, China. Sisters from the American Province of the Hospital Sisters had been in China since 1925, and in addition to providing healthcare services, they were also welcoming native Chinese women interested in religious life. However, these were difficult times in China because after the surrender of Japan had left North China in the hands of guerrilla bands, especially Communists. “There were no railroad lines, telephones or telegraphs. There was no city water or electricity, except for short intervals. The buildings and furniture at Chowtson were intact, but it was too dangerous to live there. Priests and religious (women) were being tortured and killed, and all the marks of real religious persecution were present,” wrote Sister Frances Elizabeth Schmitz, OSF, in her book “The Hospital Sisters of St. Francis in China: 1925-1987.” As the unrest in China continued, the superiors in Springfield gave permission to have all Sisters in China return to the USA. Sister Peter Damian, along with 15 other Sisters, arrived in Springfield, IL, on June 5, 1948. “In this way, the community was able to save the native Sisterhood, and also make it possible for the members to continue their religious and professional training until circumstances would permit their return to China,” Sister Frances Elizabeth wrote. For the first several years, Sister Peter Damian spent her time studying nursing, the English language and customs, and religious formation. She served at the Motherhouse, St. Joseph’s Hospital, Chippewa Falls, WI, and the Sisters’ mission in Kaoshiung, Taiwan, where she worked in the local parishes for many causes of the poor. One assignment was home to her – St. John’s Hospital, Springfield. She was first assigned there in 1969-1972 and returned in 1984. “I remember when Sister Peter came to St. John's to be trained to do electrocardiograms,” explained Bonnie Flynn. “She was enrolled in the three month program, and upon completion, she was scheduled to St. Mary's Hospital, Decatur. She quickly endeared herself to be our own special angel. I don't use that title lightly because we all felt the same way about this remarkable woman. She had such a joyful spirit that quickly brightened all of our days while we worked with her. She proved to be a very good cardiovascular technician and was well respected by her fellow workers and the cardiologists. Fortunately, before her time to leave for Decatur, we had an opening for a tech position, and to our great joy, she was given permission to stay,” Bonnie said. She worked at St. John’s until September 2002. “Her daily routine would begin with holy water: blessing the patient rooms, anyone who was in the room or nearby,” Bonnie said. “She always had holy water and used it freely on the employees, doctors, patients, and visitors all over the hospital. She was blessing everyone, and that small gesture was a beautiful example of her Franciscan spirit,” Bonnie added. “During the ground breaking of the Prairie Heart Institute, the Cardiovascular Department chose Sister Peter Damian to represent us. As far as we were concerned, she was the most important person to break the ground that day. We all stood with pride as our angel was fulfilling this task for the future of an important venture at St. John’s Hospital,” Bonnie said. “Sister Pete, as she was affectionately known at St John’s, was truly a daily presence - particularly in the Cardiac Service area where she worked,” Dr. Frank Mikell said. “She gave me two things every day I saw her—a beautiful smile and an optimistic spirit that was always positive and happy. A few seconds around Sister Pete could make a bad day good, give hope for the most hopeless of feelings, and turn a scowl to a smile. She called me Dr. Mike and was quick to bless me with holy water. I’m honored to say that she is a living example of the Holy Spirit at work,” Dr. Mikell added. “I know Sister Pete as one of those people who was always smiling…you would walk out of your way just to see if she was around to brighten your day,” said Dr. James T. Dove. “There was always a sprinkle of holy water from her which made you feel better. If she missed you as you came down the hallway, she would get you in the stairwell. Whether it was holy water or not, I don’t know, but it made me feel good,” Dr. Dove added. Several years ago, Sister Peter Damian’s brother, a priest who served in Taiwan, purchased a Norway Spruce tree for his sister. It was planted at the end of a path in Crucifixion Hill Cemetery here at the Motherhouse, and it has grown into a strong yet petite tree with very interesting character. Many consider it a living example of a petite, strong, and interesting Franciscan Sister whose spirit brightens the lives of many people. Sister Peter Damian is very proud of this tree and credits its vitality to one thing: upon planting it, she sprinkled it with holy water.